Convenient, cost-effective, and environmentally friendly, the Bella Cup is a great alternative to wasteful tampons and pads. Based in Korea, it is one of the few brand-name menstrual cups produced in Asia and may be more easily obtainable there (though you can order it from anywhere in the world). It comes in the most common two sizes, one for pre- and post-pregnancy (or women over 30), though you should choose the size that you think will fit you the best. 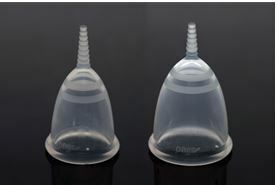 The Bella Cup is one of the softest, most flexible menstrual cups which may appeal to some women while others find that it is harder to keep the cup in position. While any menstrual cup will save you money over pads and tampons, the Bella Cup is one of the more economical options even compared to other menstrual cups. The same cup can be reused for up to 5 years.